Machine calibrated for next-level precision, these durable cast-iron KG plates are accurate to within 10g in weight. 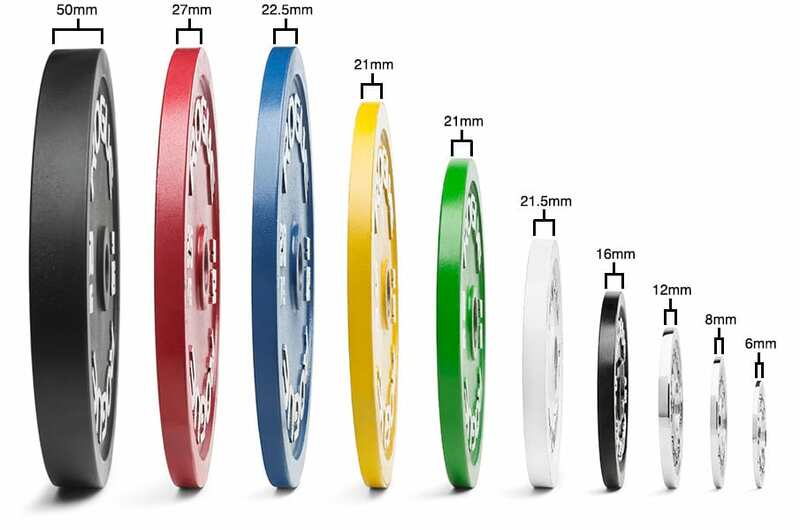 Each disc is cut thin to allow for max loading capacity (up to 700+ KG) and color-coded for easy identification from a distance. There are also calibration plugs on the back of each plate to allow for even greater precision. These plates feature a 50mm center hole for a snug fit on your barbell, and as a result may not fit on some cheaper barbells not held to spec. You can order your Rogue Calibrated KG Steel Plates in pairs or as a full set using the order column on this page. 50mm collar opening for a snug fit. Rogue Calibrated KG Steel Plates is rated 4.8 out of 5 by 32. Rated 5 out of 5 by clintonscott33 from Perfect plates Can't say I really needed them, just really wanted them. Bought 2 pair of 25 kilo plates for the garage gym. The color is awesome, a nice full red, and the white lettering is sharp. They do fit tight on the barbell, specifically on my Ohio Power Bar, so tight that the paint on the inside of the barbell opening rubs off during the first few off-and-ons. These will be handed down to my sons when they are old enough. Rated 5 out of 5 by Kodiak strong from Price beats all competition Seek around, you won't find any cheaper calibrated plates. This is the time to pick these up and enjoy them at a fraction. All in all the material is the same, even with the most expensive competition brands (cast iron). The weight is dead on. These fit best in a quality built 20kg comp barbell, the fit is snug, and a plus if used with comp collars. Thanks Rouge. Rated 4 out of 5 by Aydin from Affordable Comp Plates These plates are great from a financial point of view, however the powdercoating chips way too easily. Rated 4 out of 5 by Dylan214 from Solid Set of Plates Bought the 459 kg set and the quality is great. These are a slightly more affordable version of powerlifting competition grade plates (without a decrease in quality). However, in order to be a true competition set, the set should be 460 kg with an extra pair of 0.5 kg plates (or a pair of .75 kg) to make all 0.5 kg jumps possible. The paint does chip, especially on the inside of the center hole. Rated 5 out of 5 by Olde Man from IPF-competition atmosphere at home! Sure, gravity doesn't pull on them any harder than ugly plates, but why not have the best? And gravity doesn't pull any harder on their much-more-expensive European counterparts, either! Love the fact that they are made locally, by a local company. Rated 5 out of 5 by Jmdv from Affordable calibrated discs Not only did they ship promptly these discs are wonderful and exceed the competitors at a better price point. Can't wait to pick up more.